John Van Leer is an Associate Professor in the Department in Ocean Sciences Department of the University of Miami’s Rosenstiel School of Marine and Atmospheric Science. He is an expert in ocean Instrumentation, impacts of global warming on coastal Florida and the Arctic drivers of these changes. He is also actively involved in several international organizations who act to mitigate global warming. Van Leer teaches courses on Physical Oceanography, Marine Sciences, Climate Change and Sustainable Living. Van Leer has participated in dozens of scientific voyages to the Atlantic, Gulf of Mexico, Pacific, Bahamas, Great Lakes and Arctic Oceans totaling four and a half years, about a third as chief scientist. He has published 32 peer reviewed science publications and book chapters plus numerous technological articles. Van Leer grew up in Bethesda Chevy-Chase Maryland, graduating from BCC High School in 1958. He graduated from Case Institute of Technology with a BS is Mechanical Engineering in 1962. Van Leer worked at the MIT Instrumentation Lab (now Draper Lab) for 3.5 years. He designed re-entry guidance systems for Titan and Minuteman. Van Leer earned a Sc. D. in the MIT/WHOI Joint Program in Physical Oceanography in 1971 with Henry Stommel. 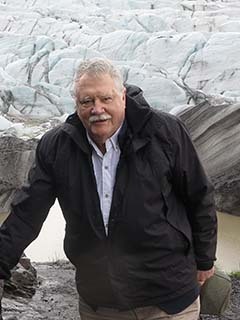 He joined RSMAS in 1971 in the division of Physical Oceanography. He developed the first moored automatic ocean profiler system with real time telemetry called the Cyclesonde, which evolved through four successive generations. This technology was used to study upwelling, continental shelf processes, and frontal circulation, Ekman layer dynamics, deep Atlantic near surface inertial response and organized mixing in the bottom boundary layer of Lake Superior under pack ice over winter. Three Arctic Ocean experiments under sea ice, culminating in observation of sea ice melt driven by upwelling Atlantic layer water, by a hurricane strength storm in late October 1988. Global warming scientific certainty compel a shift to policy and engineering solutions, which must be implemented fast enough to avoid its worst effects. Sea level rise projection and mitigation are major foci.